The Christmas decorations are up and panic is starting to set in as we see those social media countdowns about the number of days left in the year and review what’s still on the ‘to do’ list. High on the list is gifts for our amazing clients to acknowledge their support throughout the year. Unless you have a money tree growing in your backyard (ours is just a plain old Mulberry Tree! ), the amount of revenue you make in a year is based on the number of clients you work for. Having loyal clients who value the work you do and keep coming back for more is the sign of a good business relationship. While giving them a Christmas gift may seem like a token gesture, it should reflect the value you place on their business. Sure, writing a nice card and giving a box of chocolates is appreciated, but how many gifts like that do you think they receive each year? Why not stand out from the Christmas crowd and make your client gift count? It’s time to try something a little different! Personalise your gifts as much as you can to show that you really understand and appreciate each client. While it may be cheaper to buy some things in bulk, don’t give people “things” simply because you have them. Spend time thinking about each client, their interests, their business and their personalities so that you can tailor a gift for them. Then, think about your business and how you can ensure your clients know exactly who the gift is from and why you’ve chosen the items you have. We hear you singing out (or perhaps carolling?) 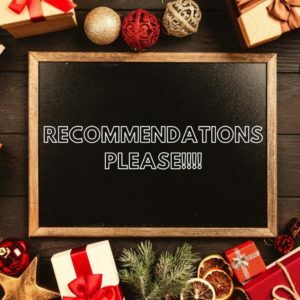 for recommendations, so we’ve done some homework so you don’t have too! This has been a big year for sustainability. 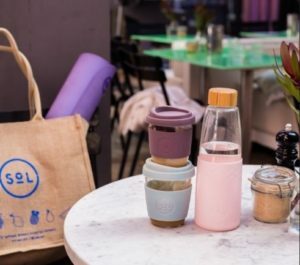 The introduction of Australia’s plastic bag ban, as well as some localised bans on single-use plastic straws, means that more than ever people are looking for sustainable options to incorporate into their lives. 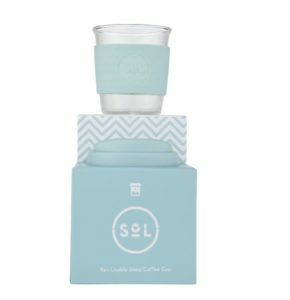 Check out the range of Sol coffee cups and water bottles available at Natural Home Co. For a reasonable price ($25-$35 each) these beautiful items can be purchased individually or as a package. These are a fantastic way to let your clients know that you care about the environment and know they do as well. It will also give them something fresh to start off the New Year in style. Thinking of a hamper with a bunch of treats inside? Consider using a wooden box with your business name branded on the side. There are a number of businesses that offer these services. Prices vary but the result is something very personal and worth keeping. Take a look at LilBoxes and request a quote. If you cringe at the thought of a pop-up anything, look away now! Check out Australian Snow Domes. 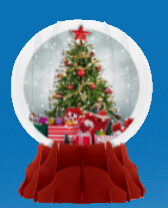 These cards are functional – there’s space to write on the card, or they will print your logo on a tag and attach it for a small extra charge, but they also pop-up into a cool “snow dome” that can sit on your desk. We still have one in the office that was gifted to us many years ago! Be careful not to go over the top, but don’t be afraid to keep things light. Make mention of something funny that happened while you were working together during the year and you will remind your client how great it is having you around! Your gift is far more likely to stand out from the crowd if you get in early. Start making your list in September/October, even earlier if you think you’ll be ordering online and need more lead time – aim to send your gifts at the of November or very early December. Generally, things are already starting to wind down for the year so you have the chance to lift some spirits and provide a happy reminder that holidays are almost here! We know there are plenty of other gift choices out there – from charity donations to monogrammed cheese boards! Hopefully our recommendations will get you thinking about how to make the most of your corporate gifting. Remember, it is the thought that counts, so do give it some thought. Are you a new leader or CEO looking to put your stamp on your organisation? A sea of opportunity awaits you. But how can you make your mark and bring the organisation along with you? And now for some good news: Australian’s trust in key institutions is on the rise. How often have you been in a meeting and thought “surely this could have been covered in an email…”? Today we remember and pay tribute to those who bravely served our country. Some returned and many did not. The spirit of the ANZACs, the qualities of courage, mateship and sacrifice, continues to have meaning and relevance for Australians and has become part of our sense of national identity. In particular today, we will remember our own family members who fought and died. As #EarthDay2019 comes to an end in Australia, we're looking forward to a week of climate action during Climate Week QLD, 2-8 June. It's the greatest environment challenge facing our generation, it seems fitting that Climate Week QLD will showcase Queensland's transition to a low-carbon, clean growth future. Brisbane will become "climate central" with representatives from throughout the Asia-Pacific region meeting to share their thoughts on how to address and adapt to climate change. This will also include a visit by former US Vice President Al Gore. Copyright © 2019 Mulberry Seed Communication Foraging. All Rights Reserved.